This is a follow-up to the comments on the previous post. I thought it would be better to put the reply in here as a separate post and add some more details along with some other snaps i had taken. And if you are a botanist reading this and find something even slightly technically incorrect, please let me know! Within this genus there are two major species : Tagetes Patula (French Marigold) and Tagetes Erecta(African Marigold or Tall Marigold). 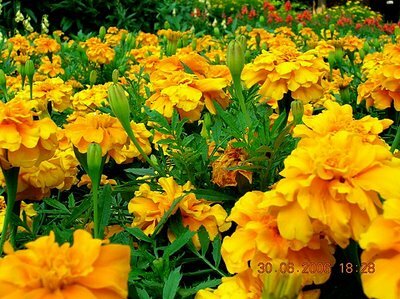 French marigolds are the smaller of the species in terms of length of the plant and are available in more shades (more orangish shades). The cultivar ('cultivated variety', see here for more info) Safari Tangerine is what we see commonly in Indian markets like here. In fact, there is even an African marigold variety that is white - the vanilla cultivar. 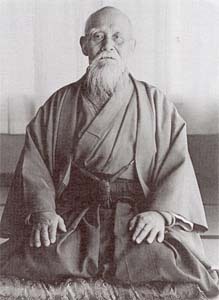 See here for picture. 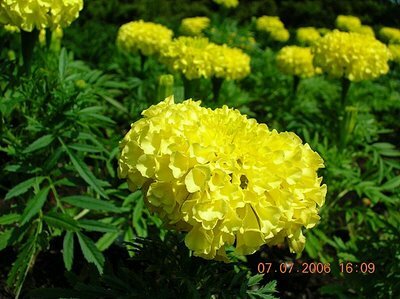 - The genus name for marigold (Tagetes) gets its name from the Etruscan god 'Tages' - the god of wisdom. - The common name 'marigold' comes from "Mary's gold" after Mother Mary. 'Torana' means gateway in Sanskrit. A garland made of Mango and Marigold is used a torana in Hindu homes. In other words, the garland is tied to the frame of the main door of the house. This garland is changed on every festive occasion - and given the number of Hindu festivals :) , you can be sure that the garland keeps changing frequently. One strong reason for the use of the flower as a torana is that it has protective properties - has an unpleasant odour that keeps insects and other pests at bay (these properites have now been well documented by researchers) . So it is particularly useful in the Indian tropical climate. But then, if it has an offensive odour, why is it used for worship? 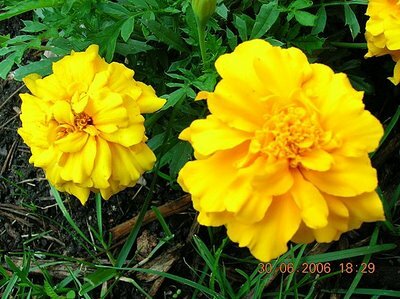 One reason straight comes from the above, in that when marigold is offered along with other pleasant smelling flowers, it performs the function of keeping insects from coming near the image that is being worshipped. In both Christianity and Hinduism, the marigold has a lot of spiritual significance. The flower is offered to Mother Mary on the Feast of the Annunciation (March 25th of every year). This is the day when the angel Gabriel came to Mother Mary to tell her of Jesus Christ's coming. On this day, in some traditions, marigold seeds are sown in pots as a symbol for auspiciousness and patience to await the divine. In Hinduism too, the flower symbolizes auspiciousness. The saffron/orange colour signifies renunciation and hence is offered to God as a symbol of surrender. While offering the flower one should also remember that marigold is a very hardy flower and has a stout, erect stalk (hence the scientific name of 'erecta') - in fact, the Sanskrit name for marigold is Sthulapushpa which signifies this. It symbolizes a trust in the divine and a will to overcome obstacles. This is also why the flower assumes such improtance on Vijayadashami - the day Lord Rama prevalied over Ravana - a victory of good over evil. totally adore the close-ups, in this post and the last! totally adore the close-ups, in this post and the last!t! Thanks for dropping by and your kind comments. You could put any flowers below the image of Ganesha. Red flowers especially Hibiscus are especially good. Avoid basil leaves ("tulsi") though. The most important thing is to have a reverential attitude towards the image. It is true that many keep a painting or idol of Ganesha in the living room for show's sake - but even then it is important for example, not to have objects like alcohol bottles etc. near it. You are pretty sure to get resources at the Andhra Pradesh Horticultural Institute. Yes, something about marigolds...all the best with your project! Really loved your post. I am linking your article in my post on Marigold Floral Arrangement. And yes, Marigolds may be plenty but each flower is unique, beautiful and reflects the divine. Keep up your good work. Cheers! Thanks for your comments, Ishrath. And you have a very cool website! I loved the this! i'll use this info for my presentation at school... thanks! I have a rosewood prayer table and 2 rose corner chairs on each side of table. On table I have East Indian prayer incense of various types with small ornate incense holders, a book of poetry Rumi, Tibetan temple bowl that is a bell held in palm of hand beautiful sound when struk it is dark with unusual geometric shape. 3 small tea light holders that sit in wooden box filled with polished river rocks & 3 various types off eggs, 4th egg is a chime, on table in center of buddah carved jadeite prayer beads, . also 2 small brass Kuan Yin goddess compassion 1open pose other closed pose. Decorative vases, marble box with elephant trunk up also brass Ganesh remover of obstacles. Tibetan staff worn under monks clothing given to me by monk also protection I use to strike bowl. Where you picture is above prayer table shelf collection painted small japanese bottles. I don't know what was contained in bottles but my imagination says powder as tops lift and small spoon attached, and water color painting of 2 koi old japanese man painted for me red stamp and signed. Black wooden Madonna statue stands in wooden box with tea lights, last but not least Shona drom south africa carving of 2 people standing intertwined. Creativity is the key of items that appeal to your senses. I am of Jamaican & Natchez American Ancestry. Great grandparents who loved one another to have 23 children. I am of 1 single branch of proud ancestral roots. Eclectic lover of world culture. Imagine Bombay University doing this? 8. Category: Who's this person?